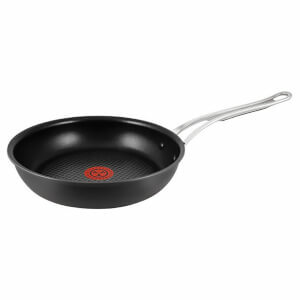 The Jamie Oliver by Tefal H9020444 24cm Hard Anodised Induction Professional Series frying pan offers the ultimate in long lasting cookware with a professional quality performance. The cookware range features a solid aluminium core, which is known for its excellent heat distribution properties, ensuring you get even cooking results without hot spots. Tefal has created their most durable coating yet with its titanium non-stick coating that is safe to use with metal utensils (except knives and whisks). Further features include Tefal’s iconic Thermo-Spot technology that indicates when the pan has reached its optimum temperature. A riveted stainless steel handle with a silicone insert ensures a secure and comfortable grip. Suitable for all hobs, including induction, the pan is dishwasher safe and oven safe up to 210°C for up to one hour.